The folks behind my favorite rhythm game franchise might not be making DJMax games anymore, but the series’ spirit lives on in Superbeat: Xonic, coming this fall to the PlayStation Vita. 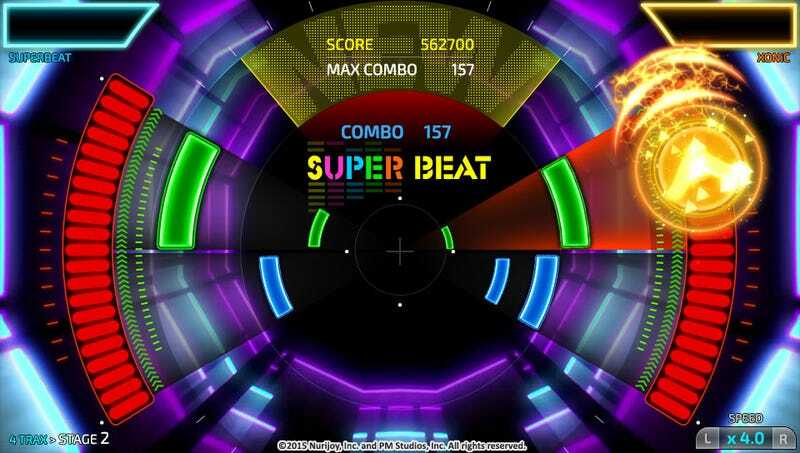 Developed for Korea by Nurijoy, a company founded by the creators of DJMax upon leaving Pentavision, Superbeat: Xonic comes to North America via a publishing collaboration between PM Studios (DJMax Fever, DJMax Portable 3) and Acttil. Let’s see, what players enjoy. For one, that’s frantic rhythm action on a screen that makes no sense to anyone not playing the game. Looking at this image I have no idea what’s going on. We’re off to a good start. Then players want a selection of quirky music. K-Pop? Great. Asian rappers trying desperately to speak English? Even better. Superbeat: Xonic features more than 45 audio tracks and multiple difficulty levels, from four tracks to six tracks and a kick in the pants. And we don’t just want quirky music. We want quirky art announcing the quirky music. Well, everything seems to be in order here. Superbeat: Xonic will be shown at E3 next week in trailer form at the Sony booth, and will be in every rhythm game fan’s Vita come this fall. For more info on the game, check in with http://superbeatxonic.com/ tomorrow.